McMullen Island is a quaint and beautiful picnic site perched above an impressive wetland with deep historical roots. The day use only facility provides picnic tables, a fresh water pump and toilet facilities at this peaceful location directly across North Dinosaur Trail from the Midland Coal Mine site. The location is the former dwelling site of the Smith Family who were instrumental within the existence and function of the Midland Coal Mine. A revealing interpretive sign tells the story. My attention to this site site is driven by a small sign identifying an opportunity to hike. The expectation is enjoyment of a hike on McMullen Island but the reality is far different. The name McMullen has important historical significance. Mr. Seneca McMullen pioneered the establishment of the Midland Coal Mine Company in 1912 and served as a principal of the company for many years while also subsequently serving the Community and Province. There may be a McMullen Island located somewhere within the Red Reer River but the hiking opportunity is access to the Drumheller Badlands River Parks Trail System. 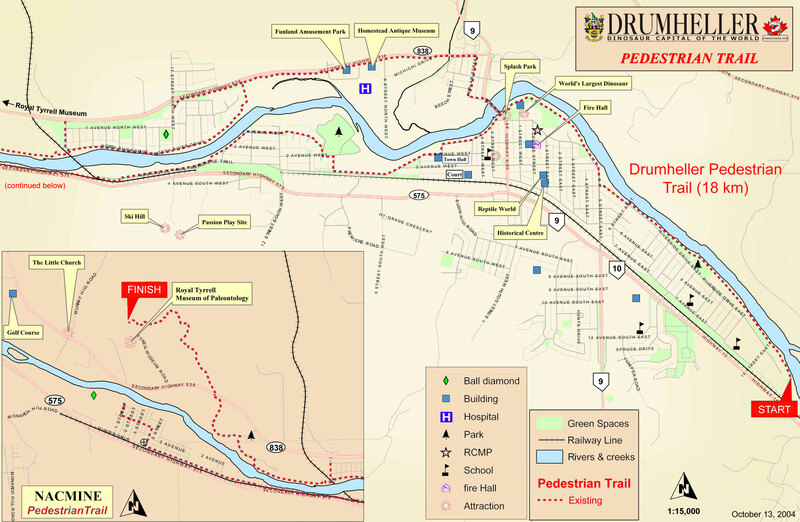 The Drumheller Badlands River Parks Trail System is an outstanding trail system for walking, hiking or cycling throughout the town primarily adjacent to the Red Deer River with extensions west to the world renowned Royal Tyrrell Museum. The hike begins in a light, refreshing drizzle blocked by the umbrella. At the Y junction past the gate, a right turn through the pedestrian gate passes a small utility building on the paved pathway northwest towards the Royal Tyrrell Museum. Close proximity to fresh Spring foliage and graceful color of Badlands features creates an unusually beautiful experience. Relatively flat trail morphs into major dips and occasional sharp turns where caution will prevent collision with foot and bike traffic coming from the other direction. The path will cross North Dinosaur Trail at a well-marked and controlled crossing on the continuing trail through Midland Provincial Park towards the museum. Retreat to McMullens Island Picnic Area is achieved via the same route taken. On return towards the picnic area, turning right away from the picnic area takes paved trail curling left on a gentle slope down past a beautiful and close encounter with a pristine wetland area where photographs can do no justice. The natural and intoxicating aroma is enhanced by the light rain. Past the wetland an open forest area leads to another Y junction where a trail sign finally clarifies the trail system. This sign would have been substantially more helpful near the picnic area. Just saying. Further progress veers toward the Red Deer River where trail side shrubbery blocks consistent river views but intermittent trail branches provide access, perhaps for fisherpersons. A series of trail-side interpretive plaques inform of local tree species and shelter bunnies who scurry away on my approach as trail continues towards downtown. This turnaround point retraces steps to the picnic area where the day's final objective will be gassing up the car, enjoying supper in Drumheller and resting overnight the the Badlands Motel prior to the drive north and east for the main objective hiking in Big Knife Provincial Park at the confluence of Battle River with Big Knife Creek. On another day, a specific and noble objective would be to allocate an entire day to tour the full benefit of the Drumheller Pathway System through town and along the Red Deer River. Undoubtedly the more urban experience will reveal a collection of fascinating historical and unique treasures with a good balance between natural and urban features. Photographs at McMullen Island, across North Dinosaur Trail from the Midland Coal Mine Company within Midland Provincial Park were taken on a drizzly afternoon on Tuesday, May 16,2017 in Drumheller, Alberta, Canada.